Emergency roof repairs can be a headache for homeowners and professional roofers alike. An emergency roof leak can occur at any time for a number of reasons and typically happens at the worst time. Emergency call outs can be costly for homeowners and time-consuming during anti-social hours for roofers. Roof repairs often involve intricate work at height, again, not ideal for roofers out-of-hours. If emergency roof repairs are not attended to quickly, they can develop into more serious issues and result in further damage to the roof deck and interior decorations, furnishings and goods stored inside. Permaroof has a solution in its liquid EPDM waterproofing range – Emergency Flat Roof Repair system. 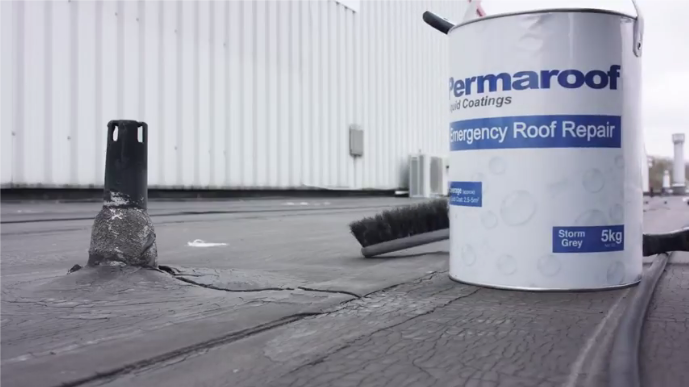 Permaroof’s Emergency Flat Roof Repair is fast and easy-to-apply to damaged roofing surfaces. The liquid EPDM rubber solution works quickly to seal cracks and tears in EPDM roofing and other roof coverings, such as asbestos, concrete, felt and wooden roof decks. Performing an emergency roof repair just got a whole lot easier! The Emergency Flat Roof Repair system can also be used for general maintenance work, as an effective sealant to make existing roofing more viable in the short-term and avoiding roof replacement. The system contains fibres that can provide additional strength to the coating and interlaces to fill and cover small cracks or tears in the roofing. Can be applied in low or high temperatures. Permaroof Emergency Flat Roof Repair is available to buy online in the Permaroof store in 5kg tins, perfect for both homeowners and trade roofers to store in case of emergency. Find out more about Emergency Flat Roof Repair and buy online today with next day delivery. What are you waiting for? Avoid costly emergency flat roof repairs with Permaroof – the UK’s leading importer and distributor of EPDM flat roof systems and accessories for trade and DIY.